Exports backfire as yen rises; neglect of compact cars? 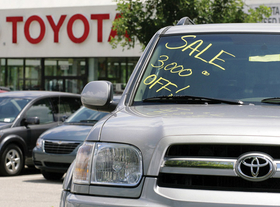 Unsold Toyotas such as this Sequoia SUV are just one sign of the automakers mounting problems. TOKYO — In six short months, Toyota Motor Corp. collapsed from the world's biggest, most profitable car company to the industry's top quarterly money loser. The roughly $28 billion swing — from record operating profit to loss — was whiplash-fast, but the problems behind it had simmered for years. After 50 years in the United States, Toyota still imports 45 percent of the vehicle it sells there. A decade-long expansion drive added to the automaker's costs. A push to speed new models to market hurt quality, opening the door for rivals. Toyota neglected the compact cars that had made it great in favor of luxury models, large SUVs and pickups. Then it all boiled over. In January to March, Toyota's red ink outpaced the loss at General Motors, which is on the verge of bankruptcy. And Japan's No. 1 automaker warns that things will get worse. "In each area, we have excesses, waste and overextension," outgoing President Katsuaki Watanabe says. Watanabe's remedy: Refocus on compact cars and hybrids. That would reverse Toyota's drift from its roots in small, low-priced cars such as the Corolla. Over the past decade, Toyota favored full-sized pickups and SUVs, as well as luxury Lexus vehicles laden with expensive features. "When the last new Corolla came out, they didn't put much effort into changing" what had been one of their most critical cars, says Kurt Sanger, an auto analyst with Deutsche Bank Securities. "Their focus was elsewhere." That shift was ill-timed. In a U.S. market collapse of 37.4 percent so far this year, Toyota Motor Sales tumbled 38.4 percent. While the Corolla and its Matrix sibling held up relatively well by slipping just 21.5 percent, the rest of the lineup dragged the total down. Imploding demand, as well as Honda Motor Co.'s low-price positioning of the Honda Fit, Civic and Insight hybrid, finally woke Toyota up. "We are determined to reduce the cost basis of our compact and hybrid vehicles," Watanabe said. Toyota priced the redesigned Prius below what analysts had expected, apparently in order to compete with the Insight. So it is already moving in that direction. But Toyota is limited in reigning in rising prices by a critical weakness. As the biggest auto exporter from Japan to America, Toyota is vulnerable to the stronger yen. The company got burned as the yen suddenly soared as much as 14 percent against the dollar in the fiscal second half that ended March 31. Toyota posted an operating loss of ¥461.01 billion, or $4.74 billion at current exchange rates, in the fiscal year. Toyota made money in the April to September 2008 fiscal first half; the losses came entirely since Oct. 1. Automakers Nissan and Honda import from Japan 23 to 28 percent of the vehicles they sell in the United States. But Toyota sold 999,527 imports in the United States last year — or 45.1 percent of its total sales. A stronger yen trims profits from every dollar sale. In 2007, when this year's cars were being developed, a dollar bought an average ¥118 so planners could figure each $1,000 in profit was worth ¥118,000 to Toyota. At today's rate, $1,000 is only ¥96,000. Over time, that will pressure Toyota to raise U.S. sticker prices, particularly for vehicles built in Japan, such as the Prius and most Lexus models. Toyota's reliance on exports and exposure to currency risk has soared. Last year, Toyota exported about 61.5 percent of all the vehicles it built in Japan. In 1996, it exported just 35.9 percent, says Chris Richter, an analyst with CLSA Asia-Pacific Markets. "It added to the pain," he says. Moreover, Toyota expanded production at home. Toyota's capacity in Japan grew from 3.73 million units in 2001 to 4.32 million last year, says Ta-tsuo Yoshida, an auto analyst at UBS Investment Research. Industrywide sales in Japan have fallen for years so all of the extra capacity was exported. Toyota expanded even faster abroad. Global capacity jumped to 9.3 million from 6.4 million in that same period, Yoshida says. Now Toyota faces a 3 million unit gap between what it plans to sell this year and what it can build. "They weren't ready for the downside," Yoshida says. "They were expecting a 10-meter tsunami, and what they got was a 30-meter one." A push for ever-quicker vehicle development hurt quality. Recalls are up. Rivals, including Hyundai Motor Co., have caught or passed Toyota in J.D. Power and Associates' Initial Quality Study in the United States. "What Toyota really needs to be careful of is that the quality gap between it and other competitors is narrowing," says Dave Sargent, vice president of automotive research at J.D. Power. "A lot of people were attracted to Toyota because of the quality." Toyota slashed global production 48.7 percent in the first quarter. In the United States, it has frozen wages, idled plants, cut hours and offered a voluntary exit program. Back home, it cut two-thirds of its 9,200 contract workers. It targets $8.22 billion in cost cuts this year. Despite the yen-driven need to build more vehicles in North America, it has delayed opening a Mississippi plant to build the Prius. Toyota says it will cancel some plants outright, but it hasn't said where. It so far has avoided drastic measures such as massive layoffs or plant closings. Even in the United States, it sidesteps forced layoffs of full-time workers. Despite the red ink, no one is talking about bankruptcy. Toyota has an ample cash cushion. Says Deutsche Bank Securities' Sanger: "They're not on the verge of a GM sickness." Real change may come June 23, when Akio Toyoda, 53, takes over as president. Toyoda, the scion of the company's founding family, promises "bold change." He is stacking the boardroom with confidants, including Yoshimi Inaba. Inaba, 63, left Toyota to run an airport but was called back to invigorate North American sales and manufacturing. At his final earnings press conference, Watanabe said: "We are currently taking steps to give concrete form to our revival efforts, which include putting in place a new management structure. And with this team playing the central role, I believe a new Toyota will be born."